The sequence is a powerful, fundamental abstraction in computer science. For example, if we have sequences, we can list every student at Berkeley, or every university in the world, or every student in every university. We can list every class ever taken, every assignment ever completed, every grade ever received. The sequence abstraction enables the thousands of data-driven programs that impact our lives every day. In this section, we develop a particular abstract data type that can implement the sequence abstraction. We then introduce built-in Python types that also implement the same abstraction. A standard way to visualize a pair --- in this case, the pair (1,2) --- is called box-and-pointer notation. Each value, compound or primitive, is depicted as a pointer to a box. The box for a primitive value contains a representation of that value. For example, the box for a number contains a numeral. The box for a pair is actually a double box: the left part contains (an arrow to) the first element of the pair and the right part contains the second. would have the following structure. We can use nested pairs to form lists of elements of arbitrary length, which will allow us to implement the sequence abstraction. The figure below illustrates the structure of the recursive representation of a four-element list: 1, 2, 3, 4. Since our list representation is recursive, we will call it an rlist in our implementation, so as not to confuse it with the built-in list type in Python that we will introduce later in this chapter. A recursive list can be constructed from a first element and the rest of the list. The value None represents an empty recursive list. """Make a recursive list from its first element and the rest.""" Both of these implementations are iterative. They peel away each layer of nested pair until the end of the list (in len_rlist) or the desired element (in getitem_rlist) is reached. The series of environment diagrams below illustrate the iterative process by which getitem_rlist finds the element 2 at index 1 in the recursive list. First, the function getitem_rlist is called, creating a local frame. The expression in the while header evaluates to true, which causes the assignment statement in the while suite to be executed. In this case, the local name s now refers to the sub-list that begins with the second element of the original list. 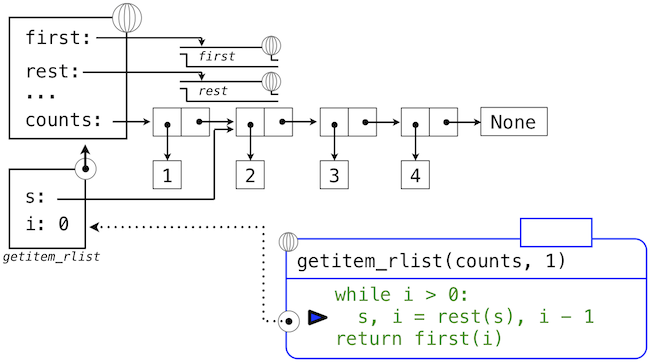 Evaluating the while header expression now yields a false value, and so Python evaluates the expression in the return statement on the final line of getitem_rlist. This final environment diagram shows the local frame for the call to first, which contains the name s bound to that same sub-list. 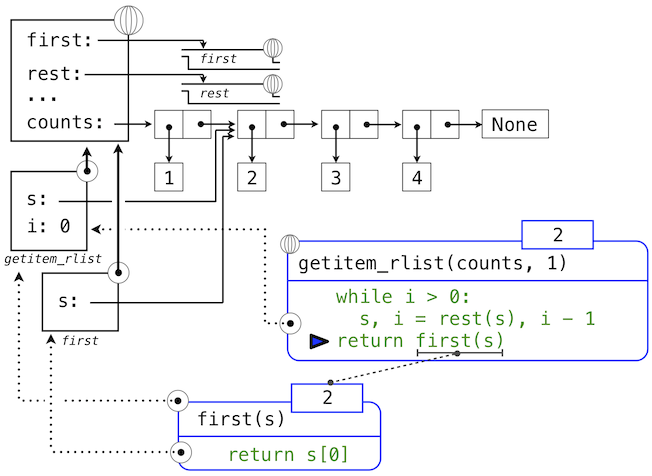 The first function selects the value 2 and returns it, completing the call to getitem_rlist. This example demonstrates a common pattern of computation with recursive lists, where each step in an iteration operates on an increasingly shorter suffix of the original list. 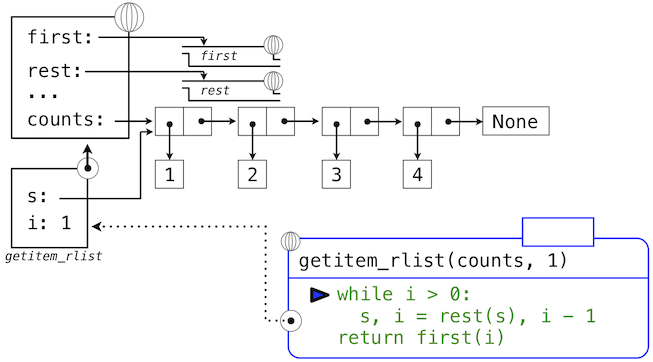 This incremental processing to find the length and elements of a recursive list does take some time to compute. (In Chapter 3, we will learn to characterize the computation time of iterative functions like these.) Python&apos;s built-in sequence types are implemented in a different way that does not have a large computational cost for computing the length of a sequence or retrieving its elements. Evaluate the header &lt;expression&gt;, which must yield an iterable value. Bind &lt;name&gt; to that value in the local environment. An important consequence of this evaluation procedure is that &lt;name&gt; will be bound to the last element of the sequence after the for statement is executed. The for loop introduces yet another way in which the local environment can be updated by a statement. >>> "I&apos;ve got an apostrophe"
>>> &apos;here&apos; in "Where&apos;s Waldo?" Multiline Literals. Strings aren&apos;t limited to a single line. Triple quotes delimit string literals that span multiple lines. We have used this triple quoting extensively already for docstrings. In working with compound data, we&apos;ve stressed how data abstraction permits us to design programs without becoming enmeshed in the details of data representations, and how abstraction preserves for us the flexibility to experiment with alternative representations. In this section, we introduce another powerful design principle for working with data structures --- the use of conventional interfaces. """Sum the first n even Fibonacci numbers.""" To evaluate a generator expression, Python evaluates the &lt;sequence expression&gt;, which must return an iterable value. Then, for each element in order, the element value is bound to &lt;name&gt;, the filter expression is evaluated, and if it yields a true value, the map expression is evaluated.